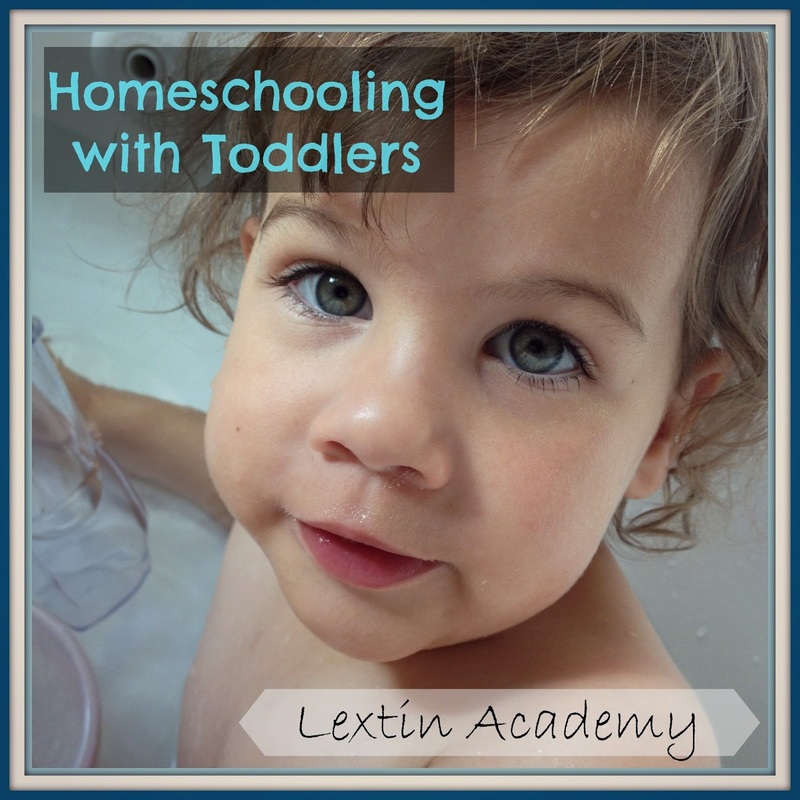 So, how can you homeschool with toddlers? I get that question a lot. I have no answer. I don’t know how you homeschool with toddlers. You just survive from disaster to the next. There is no real “way” to homeschool with toddlers. It’s about surviving and trying to stay one step ahead while simultaneously cleaning up all the disasters they leave in their wake. I am homeschooling with a toddler. I don’t know how I do it. Some days I’m fairly certain that I’m not doing it well. Have a plan and then a backup plan and then a backup plan for the backup plan. Bribe with snacks or stickers or toys. Have tubs of toys that are “special” and just for school times. Enlist older kids to help entertain while you work with siblings. Have toddler activities like file folder games and activities in ziploc bags ready to go. Use the iPad or TV when you absolutely must. It is hard to homeschool with a toddler! Give yourself some grace and focus on the basics. If you get anything else done, pat yourself on the back because you are way ahead of the game. 6:30 AM – I get Curly up to do some school with me while it’s still quiet. 6:34 AM – A little tousled head peaks out from behind the bedroom door and looks at us and then the door shuts. 6:35 AM – The door opens and shuts again. 6:36 AM – The door opens and then slams. 6:37 AM – The door opens and stays open. 6:38 AM – A little sleepy person walks toward me with a blankie in tow. 6:40 AM – She has already tried two activities and become bored. There are blocks all over the floor. 6:41 AM – She sits in my lap. 6:50 AM – She has interrupted every sentence out of my mouth as I try to teach Curly. 6:51 AM – I hand her a cup of juice and send her to her room with the iPad to watch Sesame Street. 6:55 AM – I have tried unsuccessfully to get the iPad to connect to the internet 7 times. 6:56 AM – She starts to cry hysterically. 6:57 AM – Tiger comes out of his room to see who is screaming. 7:00 AM – Tiger gets my computer and we try to watch Sesame Street. 7:01 AM – I resume lessons with Curly. 7:02 AM – Tiger tells me the computer won’t work. 7:05 AM – I realize that some type of computer plug in has crashed and videos will not stream on my computer. I move to plan C.
7:06 AM – I move the small TV to Ladybugy’s room so she can watch a Magic Schoolbus with Tiger. 7:10 AM – All is quiet and Curly and I start working again. 7:11 AM – Bee wakes up and wonders where everyone is. I let her watch the movie too. 7:12 AM – Tiger complains that he doesn’t have juice. 7:14 AM – Bee complains that she doesn’t have juice either. 7:45 AM – I’ve finally been able to do some school work with Curly and the kids are done with their movie. They come out asking for breakfast. 7:53 AM – Ladybug has to potty. 8:00 AM – We go downstairs for breakfast. 8:02 AM – Ladybug has to potty. 8:10 AM – She is upset with Tiger for sitting too close to her on the bench. 8:12 AM – She then screams at Bee for sitting too close. I try to start on memory work. 8:30 AM – We go upstairs and I put her in her room so I can work with Tiger for math and reading. Bee is playing there too. 8:32 AM – She needs to potty. I take her. 8:36 AM – She says she needs to potty. I take her. 8:41 AM – She runs to the bathroom screaming potty. I help her. 8:47 AM – She needs to potty. I take her. 8:52 AM – She says she has to potty. I take her. 8:59 AM – Potty time again. I take her. 9:10 AM – She says she has to potty. I take her. 9:17 AM – She says she has to potty. I take her. 9:20 AM – She says she has to potty. I take her. 9:34 AM – She says she has to potty. I take her again. I discover that she wasn’t done earlier and that we now have a huge mess. I throw away her clothes. 9:35 AM – I put her in the bath. 9:40 AM – I redress her. 9:59 AM – I let Tiger play with her. 10:15 AM – She decides she is mad at Tiger. She comes to lay on the floor next to me and scream. 10:16 AM – I hold her while I teach Bee. 10:30 AM – I read Bible stories while she screams on the floor next to me. I read a sentence each time she takes a breath between screams. 10:50 AM – We go downstairs for piano lessons. She plays with blocks. 10:55 AM – She fights with Tiger. She throws her blocks at him. He cries. She cries. 11:01 AM – She goes upstairs and dumps out all the crayons. They were Bee’s. Bee cries. 11:12 AM – She has to potty………..and then I cry. And this is the point when I usually start to wonder why I am even doing this. I’m convinced that she’s trying to make me lose my sanity. So, I have no real answers for how to homeschool with a toddler. I have no idea what I’m doing. What works one days does NOT work the next. Just when I think I’ll have a few quiet minutes to get schooling done, my plans backfire, screaming ensues, and I work to remain patient. One day I’ll miss having chubby little toddlers running around my feet. But today is not that day. I live with the hope that nap time is coming soon.